Plumbing complications can cause a major headache for homeowners, from low water pressure and leaky pipes to major disasters like basement flooding. Even if you are fairly handy around the house, you may not feel comfortable tackling large-scale plumbing issues or emergencies. To save yourself stress and inconvenience, call upon Friend’s Plumbing. We are Tarpon Springs, Florida’s most reputable plumbing company for prompt and quality plumbing service. 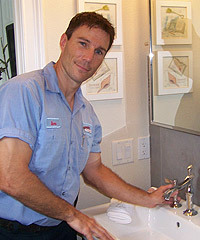 Operating in Tarpon Springs and surrounding areas like Holiday, we are here to resolve all of your plumbing needs. At Friend’s Plumbing in Tarpon Springs, we pride ourselves on true customer satisfaction. As a family-owned businesses since 1979, we are dedicated to helping residential, industrial, and commercial plumbing customers in the Tarpon Springs and Holiday areas with all plumbing needs raging from minor issues to major emergencies. 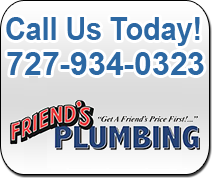 The licensed and highly trained plumbing service technicians at Friend’s Plumbing in Tarpon Springs can tackle any repair and installation issues related to septic, sewer, water heater, water softener, and house plumbing needs. Whether your drain needs a professional cleaning or your pipes have sprung a water leak you just can’t fix, Friend’s Plumbing in Tarpon Springs is there for you with the most reliable equipment and best service available. In fact, we even offer 24 hour emergency services in the Tarpon Springs, Florida area for problems that simply can’t wait. We are one of the few companies in Tarpon Springs to offer a wide variety of fully licensed, bonded, and insured plumbing services for customer protection. As a Tampa Bay focal point, Tarpon Springs is a rapidly growing area, and Friend’s Plumbing is there for every plumbing problem that might arise. With timely and affordable repair and installation services, Friend’s Plumbing is your ultimate choice for plumbing service in Tarpon Springs, Holiday, and surrounding areas. Call us today at (727) 937-1148 for a free quote or to ask about our services! 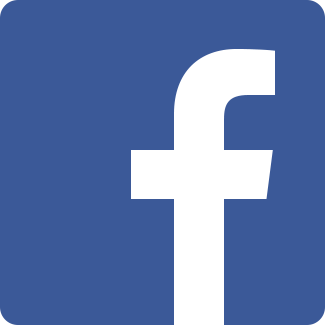 Review us on Google+ today!